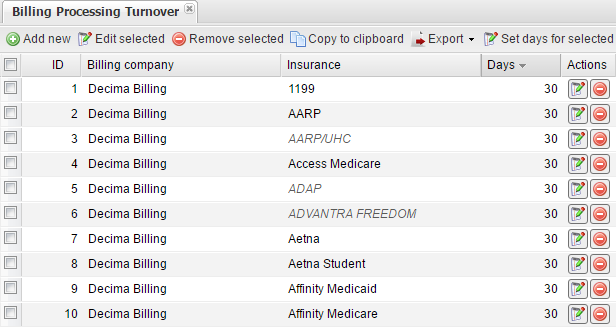 This module allows you to set turnover periods (in days), during which billing is assigned and claims are sent to billing companies. Here you can see a list of internal preprocessing turnover records arranged in five columns: ID, Billing company, Insurance, Days, and Actions. The last column contains two buttons to quickly edit or remove the records. In this window, select the Billing company and Insurance for which you need to set the turnover period. If you leave the Insurance field empty, self-payment is assumed. In the Days field, enter the duration of the turnover period in days. The Set days for selected option allows you to set the same turnover period for all identical billing companies or insurances automatically. Its default value is billing company and insurance which sets the turnover period only for the current internal preprocessing turnover record. The other two values – billing company and insurance – allow to set the turnover period for all matching billing companies or insurances, respectively. You can also use the Set days for selected button on the toolbar to assign a turnover period for selected internal preprocessing turnover records. 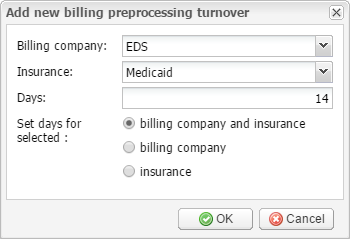 This module allows you to set turnover periods (in days) for billing processing that is done by third-party billing companies. 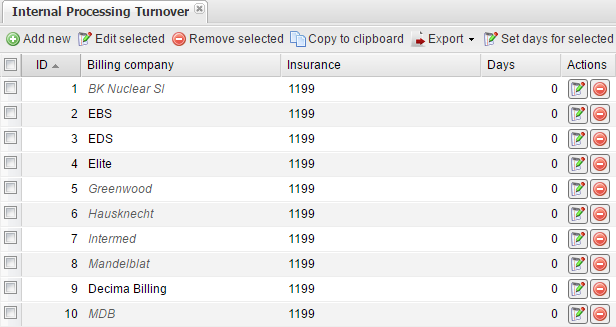 Here you can see a list of billing preprocessing turnover records arranged in five columns: ID, Billing company, Insurance, Days, and Actions. The last column contains two buttons to quickly edit or remove the records. The Set days for selected option allows you to set the same turnover period for all identical billing companies or insurances automatically. Its default value is billing company and insurance which sets the turnover period only for the current billing preprocessing turnover record. The other two values – billing company and insurance – allow to set the turnover period for all matching billing companies or insurances, respectively. You can also use the Set days for selected button on the toolbar to assign a turnover period for selected billing preprocessing turnover records. This module allows you to set turnover periods (in days) for processing claims by insurance companies and receiving reimbursements or self-payments. Here you can see a list of payer turnover records arranged in four columns: ID, Insurance, Days, and Actions. The last column contains two buttons to quickly edit or remove the records. In this window, select the Insurance for which you need to set the turnover period. If you leave the Insurance field empty, self-payment is assumed. In the Days field, enter the duration of the turnover period in days. 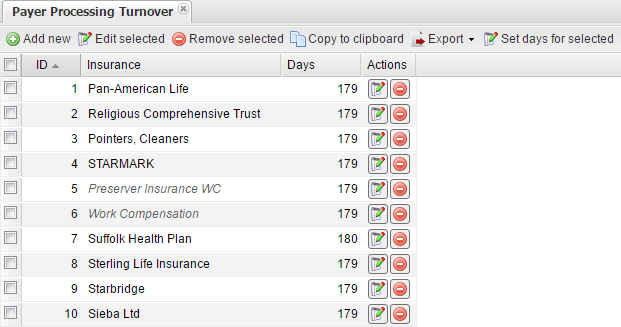 The Set days for selected field allows you to set the same turnover period for all identical insurances automatically. Its default value is insurance which sets the turnover period only for the current payer turnover record. The other value – all insurances – allows to set the turnover period for all matching insurances. 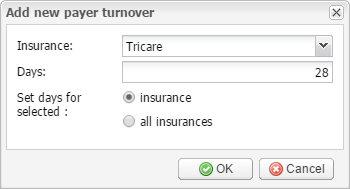 You can also use the Set days for selected button on the toolbar to assign a turnover period for selected payer turnover records. This module allows you to set turnover periods (in days) for returning processed billing data from billing companies. Here you can see a list of billing processing turnover records arranged in five columns: ID, Billing company, Insurance, Days, and Actions. The last column contains two buttons to quickly edit or remove the records. The Set days for selected field allows you to set the same turnover period for all identical billing companies or insurances automatically. Its default value is billing company and insurance which sets the turnover period only for the current billing processing turnover record. The other two values – billing company and insurance – allow to set the turnover period for all matching billing companies or insurances, respectively. You can also use the Set days for selected button on the toolbar to assign a turnover period for selected billing processing turnover records. This module allows you to set turnover periods (in days) for the processing of billing results and the closing of billing operations. Here you can see a list of internal processing turnover records arranged in five columns: ID, Billing company, Insurance, Days, and Actions. The last column contains two buttons to quickly edit or remove the records. The Set days for selected field allows you to set the same turnover period for all identical billing companies or insurances automatically. Its default value is billing company and insurance which sets the turnover period only for the current internal processing turnover record. The other two values – billing company and insurance – allow to set the turnover period for all matching billing companies or insurances, respectively. You can also use the Set days for selected button on the toolbar to assign a turnover period for selected internal processing turnover records.